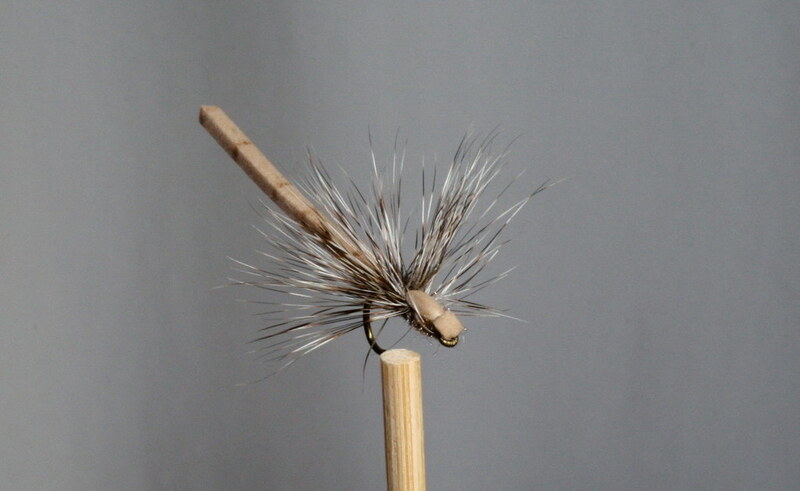 note: hackle is tied as a parachute, post is then drawn forward over thorax and tied down over the eye. Its late summer and the days are just now starting to get shorter. Nights are longer and cooler. Trout cruise the shallows of my favorite stillwater. The fish have a sense of the changing season. They feed mostly on unseen nymphs and scuds, occasionally rising to a bug on the surface. Mid afternoon and the sun is high. There is no hatch to speak of and the wind is starting to blow. Through the clear water I can see well enough to tell the rainbows apart from the browns. There aren't many of them but if I'm patient and range quietly around the bay I find them. I'm casting through the wind. The fly splats down above a fish. 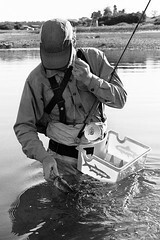 Without hesitation the trout rises to take the adult damsel imitation. I wait for the fish to turn down before I strike but it happens fast and I don't remember when I struck. I land this one and many more. I also break a few off. The wind blows harder, the trouts continue to rise to my fly as it bobs along in the whitecaps. Sight fishing to big browns and rainbows almost as good today as it was the day I was out there five years ago. boldly simple. well done flytimes.